With smoke pooling in the Tahoe Basin, members of congress from Nevada, California and Alaska took the stage at Sand Harbor this week for the 22nd annual Lake Tahoe Summit. While the representatives touched on a number of issues regarding Tahoe and the importance of public-private sponsorships in the fight to preserve and restore the lake, there was no ignoring the effects of the largest fire in California state history as the members of Congress stood in front of a lake clouded by haze. The summit came on the heels of the University of California, Davis annual report on Lake Tahoe, which showed record surface water temperatures and record-low clarity readings. The event’s keynote speaker and first to take the stage to address the crowd was U.S. Senator Lisa Murkowski (R-Alaska). The summit also included remarks from Sen. Dean Heller (R-Nev.), Sen. Catherine Cortez Masto (D-Nev.), Rep. Tom McClintock (R-Calif.), Rep. John Garamendi (D-Calif.) and Nevada Seismological Laboratory Director Graham Kent. Murkowski compared Alaska’s issues concerning lakes and wildfires to those of Nevada and California, while highlighting the work done recently in the Senate to pass an appropriations bill. The bill, which was passed Aug. 1 and will now head to the House of Representatives, provides funding for the Department of the Interior (Bureau of Land Management, U.S. Fish and Wildlife Service, National Parks Service, Wildland Firefighting and Prevention, etc.) and Environmental Protection Agency. The battle against invasive species hit a landmark of 10 years without any new organisms finding a foothold in the lake. Heller took to the stage following Murkowski and announced AlertTahoe had been allocated $226,000 from the US Forest Service to install and maintain new fire cameras in the Tahoe Basin. Kent used much of his time on stage to promote the system of cameras as a cost-effective way of staying on top of wildfires. While California deals with fires across the state, Feinstein delivered news on the front with the addition of seven C-120 airplanes, which have been transferred from the Air Force to the California Department of Forestry and Fire Protection. 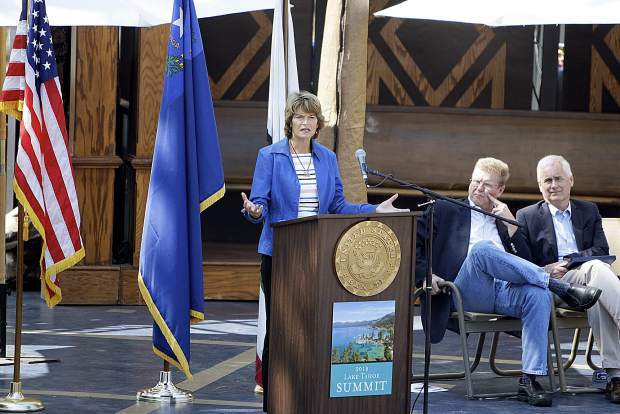 Moving into the future, Murkowski said all eyes on are on Tahoe and what policies and projects the public and private entities tasked with protecting the lake will take up.